Randy Gervais was born and raised in New Orleans, Louisiana. He began high school in 1972, but he was convinced to take time away to become a jockey. After completing both his jockey career and graduating from high school, Randy worked for a year for an audiovisual company. He then decided to leave his job to start his own company, which has been successful ever since. 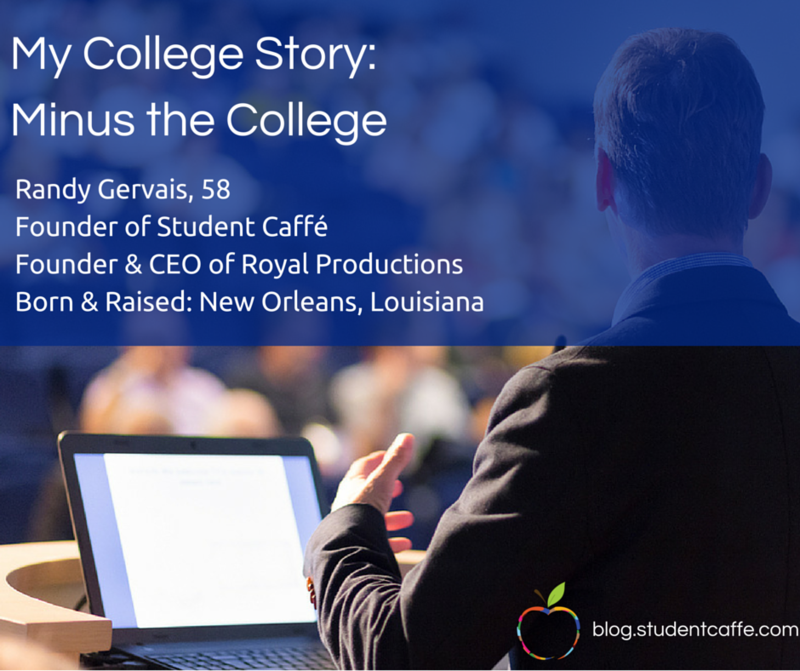 Randy continues to run his company but also spends his time furthering the mission of Student Caffé. Q. You took a different path to education. Can you tell us about it? I attended Chalmette High School in St. Bernard Parish, Louisiana. In 1972, as a freshman, I began working a job at a gas station. A gentleman came in and said, “What are you doing pumping gas? At your size, you should be a thoroughbred jockey.” And from that moment forward, I decided to quit school to train. I was lucky to be transferred back to Louisiana, where I could train as a jockey while also attending school. Doing both was very rare. Many jockeys drop out, stay out, and focus on their careers, but I went back to high school and graduated in 1976. Q. You decided to retire from being a jockey in 1985 at the age of 27 without a college degree. What did you do next? When I retired from racing thoroughbreds, I came home to Louisiana after working up east in New York and Philadelphia. I didn’t have a job lined up, so I did what I had done when I was 12 years old: I opened the Yellow Pages to look for one. That was something I had started doing at a very young age. I would open the phonebook and call up different companies to ask if they needed help. In the past, I had gotten jobs at grocery stores and gas stations, anything I could find. When I came home after my days as a jockey, I gave it a try again. It was the craziest thing: The Yellow Pages started with the letter “A,” so I called an audiovisual company. I knew nothing about the industry, but I got an interview for a technician position. They gave me the job. A year and half later, in 1987, I opened Royal Productions, an audiovisual company, at age 28. Q. How did you get your audiovisual education and start your own company in the field if you began with no prior knowledge or education? The first job I had in the field, thanks to the Yellow Pages, was as a technician. My job was to set up equipment. It came easily to me, and I learned it quickly. I figured that I could do it on my own. I prayed when I was thinking about opening up my own company—I have to be straight with you—and my prayer was answered. I don’t know how else to explain it, but that’s the truth. What helped me become successful so quickly after my retirement from professional sports was that I had begun working at a very young age in a very poor town. I came from a modest family and public schooling. All of the work I had done since age 12 helped me when I opened my own business. I had done so much in that short period of time that it’s almost unbelievable. Even today when I look back, I don’t know how I did it. But I had walked away from each experience with a lot of knowledge, and I guess I was fearless. I believe that this is how it was meant to be. So, 29 years later, I’m here at Royal Productions. I’m doing a job that I learned thanks to the Yellow Pages. I also started Student Caffé. My education came from hands-on experiences that I acquired by being in the business environment at a young age. Q. Did you find a mentor that influenced you? I did. I found a mentor in one of the first people to sign an audiovisual contract with my company, a gentleman named Ronald Pincus. At the time, he was the general manager—and still is the general manager—of the Omni Royal Orleans Hotel, which was the premier hotel in New Orleans 29 years ago. It still is and always will be one of the bests. He was an uncommon mentor at first. We didn’t know each other well on a personal level, but he made an effort to get to know the work I was doing in audiovisuals. I really admired his integrity and how he did his job impeccably. In my contracts with him, I worked especially hard because I wanted to exceed his expectations. I don’t think he realized how much he was helping me when I was getting my start. In fact, I know he didn’t realize it. I’m still contracted with him to do audiovisual work in his hotel today, and our relationship has grown over the past 29 years. I started to think of him as a surrogate father. He was someone I could talk to about anything. It’s been a tremendous asset to have an open door with him. Today he realizes how much he has helped me. Because of the size of my company and how much it has grown, he knows that I still work tirelessly. I think he is happy to be my mentor because he’s seen how hard I work. I’ve never shown him anything besides my true self. I know who I am and I don’t let the size of what I’m trying to do change me. Q. What does it take to educate yourself? How can you open up doors for yourself if you don’t have the opportunity to pursue higher education? It takes drive. Every individual needs to have the drive to put him/herself into a place of sacrifice; you can’t have it all. I made sacrifices when I went to work instead of going to college. The sacrifice built character and showed me the value of hard work. Don’t be afraid. Education is important to everyone, but it doesn’t look the same for every person. That’s why Student Caffé offers a plethora of information on everything from vocational school to higher education. We want to help motivated, driven people find their happy place. People—young people especially—have a lot of options, and I believe that it’s challenging for them to choose a path. Higher education is a positive, productive way for some students to educate themselves, but it’s not for everyone. There are many smart, ambitious people who do not have a formal education. I believe that hiring managers need to look at every candidate individually and ask, “Is he capable? Is he willing?” If so, he’s probably smart enough to brush away self-doubt and excel in the position. Formal education can teach confidence, but so can other experiences. It’s an individual choice to excel or not, regardless of your circumstances. It’s no different from those who have to spend hours doing homework to get an average grade when there are those who can study the same material for one hour and get a high grade. The character building comes from putting in the time and working hard. Even if you aren’t seeing excellent results at first, you should be proud of what you achieve; it has success stamped all over it. People who put in the effort often pass by the others in the business world. It’s not always about natural talent and privilege. It’s often about the willingness to work hard. Because of my experiences, I view college as a luxury. Graduates have an edge, but there are many paths to success, and they all start with an individual’s drive. Even today, I sit in meetings with executives who have countless years of higher education under their belts, and I have none. I just have to pay attention and work hard, which I do. The character building that I did when I was young goes a long way. It has motivated me to succeed in my career and given me the confidence to see myself as smart and valuable. Without a formal education, you can still learn. Your success is what you make of your circumstances, and it’s worth every second that you put into it. Q. What is the secret to success? It’s not much of a secret: Success is about drive and willingness. You can choose whether or not you want to be successful. Success in school may be measured with grades and test scores, but the business marketplace is not just about what you accomplish; it’s about how you do your work. In that kind of environment, you must make choices. Do you want to keep learning on the job and actively bettering yourself? Or, do you want to show up for the paycheck and count down the hours until the end of the day? One of the goals of Student Caffé is to help you get through school, if that’s the path that you so choose. Other goals of ours focus on helping you build the skills to succeed after you finish your formal education. Our blog posts talk about ways to deal with real life matters that interfere with career, education, and relationships. We stress the importance of finding a good mentor and role model, and we encourage you to become one in stride. If you are proud of the work you do and if you are kind to the people you encounter, you’ll be more satisfied overall. Happiness—that’s exactly what we all want from life. It comes from balancing education, work, family, friends, health, and more. I hope that Student Caffé helps its users find that balance.